The WMS Boathouse at Clark Park will be home to a state-of-the-art, one-of-a-kind indoor rowing tank. This tank will have 16 sweep oars/seats fixed inside a specially designed indoor pool. The outside channels can accommodate 8 starboard and 8 port rowers. Alternavitely, the center channel can be used instead which can accommodate 8 scullers or 4 port/4 starboard rowers. It is especially useful for teaching beginner and novice rowers the basic stroke technique or to pinpoint minor stroke corrections in experienced rowers. Participants in the Learn to Row in a Tank program will learn the fundamentals of sweep rowing, including rowing technique, rowing vocabulary, safety and teamwork all while getting a great cardio workout in a safe environment. The next tank class will be offered in the Spring of 2018. Check out our Learn to Row classes for the summer, which will be on the water. Are you interested in getting a group together to learn to row in a tank? Simply contact Maida Wallin to set up your individualized rowing class with a minimum of one session, that meets the time and dates that are most convenient for you. 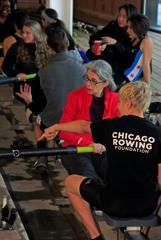 Classes are conducted at the new state-of-the-art boathouse, WMS Boathouse at Clark Park, which has a one-of-a-kind dynamic propoulsion indoor rowing tank. Cost is $100/hour for the tank rental and $50/hour for a coach, minimum of 5 people required to schedule tank session. If you are a visiting rowing team, and would like to rent the tank at WMS Boathouse at Clark Park, please let Maida know so we can respond quickly and appropriately.